Underlayment stiffens subfloor. A layer of quarter inch plywood glued and nailed to the subfloor reduces the risk of cracked tiles. "Hey dad, those dots down at the end are crooked," Christopher, my 5-year-old, observed while looking over my shoulder at a recent job. He was referring to the small square tiles that I was installing between larger octagonal tiles, and sure enough, those dots were crooked. I had to chuckle because Christopher's remarks sent me back 25 years, when I first tagged along with my dad on tiling jobs. Back then, I figured I was a big help to my dad, but having one less kid underfoot was probably more of a help to my mom. Now I have my own tiling business, and I bring Christopher along on jobs when time and safety allow. As Christopher grows up, tools and techniques will continue to evolve. But proper prep work will always be the most important part of any tile job. Take the bounce out of wood floors — Most of the tile work I do these days is in houses with wood-frame floors, and there are many approaches to laving tile on top of these floors. To make a wood-frame floor structurally sound, I like to work with a substrate thickness of at least in., which includes the subfloor and any underlayment. If I have doubts about the strength of a certain area, I check the floor for spring or movement by walking on it. 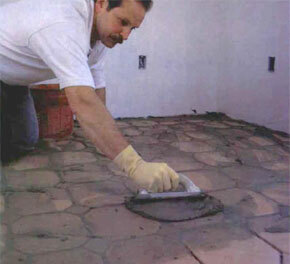 Any give in the floor can mean cracked or loose tiles or loose grout in the future. But floor stiffness isn't the only consideration when building up substrate to the proper thickness. Tile substrate also has to be stable. Some tile installers just put down layers of underlayment plywood to achieve the right thickness, and I've occasionally and reluctantly installed tile over this type of floor. My reluctance stems from the fact that wood expands and contracts with changes in temperature and moisture. On the other hand, tile moves very little and, when installed directly on top of plywood underlayment, can crack as plywood moves, especially at the seams between the sheets. 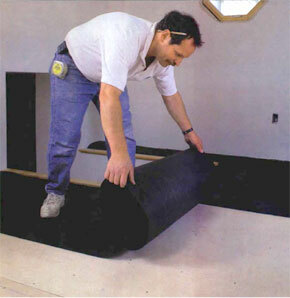 Areas of high moisture such as bathrooms and kitchens are even more prone to underlayment movement. -board is as rigid as plywood. So when I do use backerboard, instead of using a single thick layer, I install a thin layer of backerboard over a layer of plywood to make the substrate stronger. But even when backerboard or plywood is properly installed, the seams between sheets can telegraph to the tile as the substrate moves. Telegraphing, the most common tile problem I see, can cause tile to crack or grout to loosen in conspicuous lines across the floor. Concrete and wire mesh make the strongest substrate—Probably the best foundation for tile over a wood-frame floor is an oldfashioned mortar bed, known in these parts as a mud job. In the simplest terms, a mud job involves laying down a curing membrane of tar paper on top of the subfloor with wire-mesh reinforcement and an inch or two of concrete on top of that, depending on the specific job. Aside from the messy installation, the biggest drawback to this method is the extra thickness it adds to the floor. In some cases the finished height of the floor could be in. to 2 in. above the subfloor, which can interfere with doors and create uncomfortable, unsafe transitions between rooms. If a client wants a tile floor to be the same height as an adjoining hardwood floor, a full mud job is usually out of the question unless proper adjustments in the subfloor height have been made early on. Recently, I tiled a foyer using a handmade, octagonal Mexican terra-cotta, with small square accent tiles. The height of the tile in the foyer needed to be close to the height of the -in. oak nosing that had already been installed at the top of the basement stairs. The tile was in. thick, which left me with limited space for underlayment. Because the foyer would see heavy traffic, I didn't feel comfortable using backerboard. My solution was installing a modified mud job with a process that I've used successfully for over 20 years. 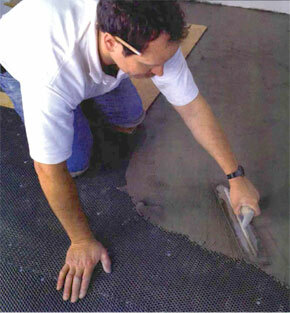 This system creates a substrate almost as strong as a full mud job and keeps the finished floor at a reasonable height. 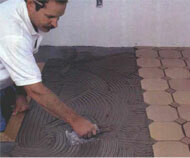 More important, a modified mud job is stable and isolates the tile from any substrate movement. Expanded-metal lath reinforces the cement. Metal lath, which is used primarily for plastering and stucco, is stapled to the felt paper to strengthen the shallow layer of portland cement. inch underlayment plywood to give extra strength and to act as a height filler (photo facing page). 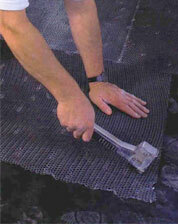 As with a full mud job, the underlayment was covered with a curing membrane of 15-lb. felt paper (tar paper) (top photo). I overlapped the seams of tar paper a couple of inches and stapled it to the underlayment every 6 in. to 8 in. The tar paper serves a couple of purposes. It lets the cement cure properly by keeping the plywood from drawing moisture out of the cement. Plus, tar paper is the layer that isolates the cement and the tile from any movement of the plywood underneath. In a full mud job, the next step would be laying down wire mesh on top of the tar paper to reinforce the cement. But with my modified system, I stapled galvanized metal lath over the floor instead (bottom photo, p. 61), overlapping the seams between the sheets about in. and making sure the lath was lying perfectly flat on the tar paper. Metal lath is available at most drywall or masonry-supply stores and normally comes in 2-ft. wide sheets, 6 ft. or 8 ft. long. Metal lath can be cut with ordinary tin snips to fit irregular shapes or spaces. (above.) A thin layer of cement tops off the mud job. A full mortar bed would be too thick for this floor. Instead, a thin layer of cement is troweled over some wire lath to complete the substrate. Test-fit the tiles for the best layout. A good layout takes more than measuring. Dryfitting tiles shows the tilesetter exactly how the tile will look in the most critical places. Next I covered the lath with a wet 50/50 mixture of portland cement and fine builders sand (top photo). Fine sand without pebbles is a must to make sure the cement goes over the lath without lumps. I spread the cement with a steel trowel in a smooth layer about in. thick, leaving no ridges and letting the trowel ride on the lath. When the cement was spread completely, the texture of the lath could still be seen through the cement in places. The next day, while the cement was still relatively fresh, I removed high spots with my trowel, and I was ready to lay out and set the tile. Dry-fit the tiles to figure the best layout— The floor of the foyer would be seen from every direction—on entering the house, coming down from upstairs or coming up from the basement—so the tile layout was critical. The layout of the foyer tiles also determined the layout of the tiles on the basement-stair landing, which led to many more hundreds of square feet in adjoining basement rooms. 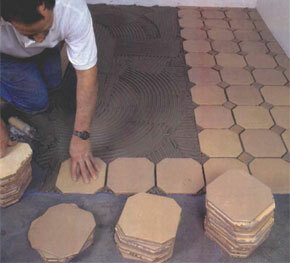 To complicate matters, the handmade Mexican tiles were not uniform in shape and thickness and measured a nominal in. rather than the more convenient 8 in. the difference in order to have good-size pieces of tile at both the front door and at the head of the stairs. Using straightedges and a framing square, I laid out a second line of tile perpendicular to the first. I lucked out in the foyer because my perpendicular layout gave me a full tile at the bottom of the stairway to the second floor and a full tile against the wall next to those stairs. When I was happy with my layout, I marked the floor at the edge of the tiles and snapped lines in both directions. Although I did my preliminary layout as carefully as possible, I had to tweak the layout lines a little to get the snapped lines perfectly square to each other. In this project my snapped lines revealed that the stairwell was about in. out of square. But I was able to adjust the joints between the basement- stair nosing and the tiles, and once the tile was installed and grouted, the joints that I'd fudged were barely noticeable. When I was satisfied with my snapped lines, I snapped a couple of parallel lines a few courses ever to keep the tiles running square and straight. Another major consideration when laying out tile is waste. These Mexican tiles were not cheap, so I tried to lay out the tiles so that whatever waste I cut from a tile to fit it along one wall could be used along another wall somewhere on the job. Use a trowel with bigger teeth for uneven handmade tiles—To make sure the tiles adhere well to the substrate, I try to obtain at least 85% mortar coverage on the setting surface, or the backside, of the tile (center photo). Because the setting surfaces of these handmade tiles were not perfectly flat and because the tile thicknesses were varied, I chose a trowel with -in. notches to spread the mortar. The deep teeth on the trowel left high ridges of mortar that spanned the irregularities that were on the backs of the tiles and that also ensured proper coverage (top photo). The foyer tiles were being installed over the modified concrete bed, so I used a standard thinset mortar that is mixed with water. I spread the thinset mortar up to my chalkline, taking care not to obliterate it. Then I pulled the trowel away from the line, maintaining full depth of the mortar at the edge of the tile where it lined up with the chalkline. Bigger teeth for higher ridges. A trowel with -in. teeth leaves mortar ridges high enough to reach all the parts of the tiles' uneven bonding surfaces. of the tile's setting surface, as with the tile on the left. Start the tiles at the layout line. Working back across the room keeps the tiles running straight and square from a snapped layout line. Beginning at the comer of my layout lines, I pressed the tiles into the freshly combed mortar along one of the lines (bottom photo). I adjusted the tiles until the spaces between them appeared equal. Spacers that can be inserted between tiles are available at tile stores, but I don't like using them. The spacers are tough to get out once they're installed, and if left between tiles, they can interfere with grout. When I was satisfied with the spacing, I filled in the field, starting at the perpendicular layout line and checking the pattern regularly to keep my lines of tile straight and square. After installing two or three rows of tile, I went back and inserted the small square tiles between the larger tiles, making sure they'd pass the scrutiny of my keeneyed 5-year-old. A wet saw cuts through tile with a diamond blade. Tiny diamonds on edge of a wet-saw blade make quick work of cutting through even the thickest tile. the grout. Before the grout is spread, excess mortar that has oozed up bet-ween the tiles is taken out with a putty knife. The Mexican tiles were of three different clays, so the colour varied significantly from box to box. To get a homogeneous blend of colours, I worked from several boxes at the same time. A wet saw offers the easiest way to cut some tiles—The tiles along the outside wall and the stairs to the basement had to be cut to size. But because of their uneven surface, handmade tiles cannot be cut well with a conventional score-and-snap tile cutter. Instead, I used a wet saw, arguably the most valuable tool in the tile setting trade (top photo). A wet saw can make right-angle cuts or take small slices that are nearly impossible with a score-and-snap cutter. The edge of a wet-saw blade is encrusted with industrial diamonds that can cut through any tile. A fine water spray lubricates and cools the blade as it cuts. If you do a lot of tiling, a wet saw is a must. But even if you tile only occasionally, it's worthwhile to rent a wet saw for the job. At $50 a day, a wet saw can save you hours of aggravation and give your job a more professional look. 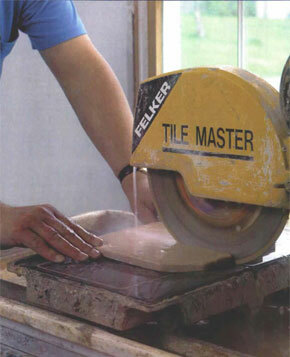 Tile nippers are another useful tile-cutting tool. They come in handy for fine cutting around obstacles such as pipes and corners. Nippers are basically pliers with opposed cutting jaws. They might seem easy to use at first, but it takes time and patience to get the hang of using nippers. The most important part of using nippers is removing just a little of the tile at a time. Grab the edge of the tile between the nipper's jaws and pull down while squeezing the handles together gently. I nibble away at the edge in this manner until I've removed all the waste. (bottom photo). A trowel or a stiff putty knife works well to remove these ridges. At the same time, I gave the tiles a good cleaning with water and a sponge to make the grouting easier. Because I had so much tile to grout, I mixed 2 gal. or 3 gal. of grout at a time in a drywall bucket using a blade-mixer bit chucked into a -in. drill to speed up the process. Instead of water, I mixed the grout with a latex additive, then let the mixture slake (rest or stand untouched) for five minutes before mixing it again. The additive strengthens the grout and makes it more water-resistant once it sets up. Epoxy grouts that are strong and stain-resistant are also available. However, these grouts are also labour intensive because of a more difficult cleanup process. I rarely use epoxy grout on floors, and because of the large scale of this project, I opted for the latex-modified grout instead. Epoxy grouts are not recommended for these handmade tiles. 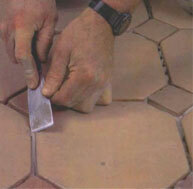 Handmade tile is porous and can absorb moisture from the grout, making it set up more quickly. 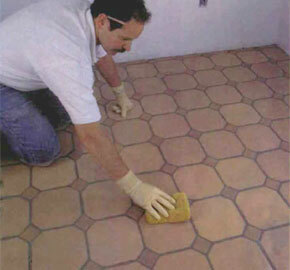 The latex additive is harder to absorb, so it keeps the grout from setting up too quickly. Damp weather can also lengthen setup time. If I have doubts, I grout a small sample section before attacking the whole floor. Also, I check to make sure the grout doesn't stain the tiles. The tiles I used on this project were sealed, so staining was not a problem. But other handmade tiles may have to be sealed before they are grouted; otherwise, you'll have a huge mess. The basic trick to grouting is to fill all the joints before the grout starts to get stiff. I spread the grout in broad diagonal strokes with a rubber grout float working across the joints in the tile (top photo). After going back and forth in opposite directions with the float, I pushed the grout into the highs and lows of the irregular terra- cotta tile with the palm of my hand. Rubber gloves are a must for this step. Next I gave the tiles a double wash with clean water (center photo). The first wash removed the heaviest grout residue, and the second neatened the grout joints. When the tiles were fairly clean, I let that area sit for about 15 minutes. It usually takes that long for the wash water to evaporate, leaving a film or haze on the tile. Then I wiped off the film with a clean terrycloth rag (clean cheesecloth also works well) and brought the tiles to a shine (bottom photo). 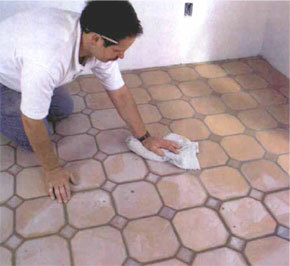 Sometimes the haze doesn't come off the tiles with plain water, and a stronger cleaner may be required. I recommend trying full-strength vinegar first and using a sponge with a layer of mildly abrasive Scotch-Brite on one side to loosen stubborn grout residue. As a last resort, you can use a weak acid solution (about 1 part acid cleaner to 8 parts water), but remember to rinse the tiles thoroughly with clean water after the acid wash or vinegar. Like these handmade Mexican tiles, many tiles now come with an epoxy wear coating that keeps the tiles looking great for a long time. However, for tiles such as these, I suggest applying a liquid top coat, also called a traffic coat, once or twice a year to renew and to help protect the finish. For cleaning these tiles, any pH balanced cleaner works fine. Spread the grout in broad diagonal strokes. 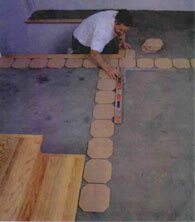 To make sure all the joints are filled, the grout is pushed back and forth in large strokes across the tile joints. A wet sponge cleans off the heavy residue. A wet sponge is used to remove the heaviest grout residue. Two or three washes are necessary before leaving the grout to set up. A clean towel wipes away the haze. After the water dries and the grout has had a chance to set up, a terrycloth towel removes the haze from the grout and brings out the shine.